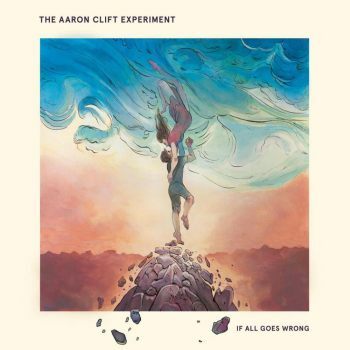 The Aaron Clift Experiment is based in Austin, Texas in the United States Of America. If All Goes Wrong is the third studio album. Background Magazine wrote a review of the second studio album, Outer Light Inner Darkness from 2015 (see review). The review for If All Goes Wrong is up to me. Just before they went into the studio, Eric Guitierrez left the band. That meant they had no guitar player at that moment. Devin North, the bass player, played a lot of guitar for this one. Besides Devin the band consists of Aaron Clift on vocals and keyboard and Tim Smith on drums and percussion. There are too many guests on this album to mention them all. Musically this album has a variety of styles to give you. Faith is an original 70's rock song, however it has not really anything innovative. In Last Crash everybody can do his thing, from melodic to technical. It is a bit threatening and because of that you can feel the good vibes. For me this is a good one. Absent Lovers is the longest track. It starts with violin, viola and cello. You can feel the emotions. It has a beautiful combination of classical music and melodic rock. But, and then I have to be strict, there are too many styles in this song that do not belong to each other. If all the different styles were worked out in several songs, I guess that would fit better. A missed chance. Better Off Before is a nod to Queen, but not really original. In the song Castle In The Sky you hear a technical intro combined with classical guitar, it does not fit. In Savage In A Fancy Suit you will hear Deep Purple. In this one I hear a good piece of keyboard. Dream Within A Dream starts with a beautiful solo on guitar. Devin plays the bass so well, it all seems to be good but then, again, like in the other long track Absent Lovers, there are too many different styles brought together in this song. I miss a central theme. Wild Hunters is one of the real good songs for me. It is more classical rock, it starts and ends with a guitar solo, the rhythm section is really good here and it is a coherent song. If All Goes Wrong has detail for all instruments and a lot of emotion, a good piece of mellotron and a great guitar solo. The bonus track Back To The Water is a ballad accompanied by piano and the fragile voice of Aaron. And to mention the singing of Aaron, sometimes it is okay, but several times he is out of his range, as if he stands on his toes to reach what he wants to, and that sounds not good. All-in all I can conclude that the album surely has its moments, but too many times I miss the central theme in the music. But please, judge for yourself.